Garage Interior Remodeling|Is your Garage a disaster in the making? If you find yourself afraid to move around freely within your garage space for fear of something falling over and possibly injuring yourself and or your new car then it might just be time to invest in a Garage Rack System. Transforming your garage into a safe, inviting garage, even possibly becoming your man-cave domain. Ohio Garage Interiors is a garage interior remodeling business offering a variety of different design services. They can adapt to virtually any existing garage space and create a space that suits you best. From cabinets, epoxy floor coatings, garage rack systems, and more. Ohio Garage Interiors has built a reputation for reliability and design services. Their products are extremely durable and offer extensive longevity. With Ohio Garage Interiors, your dream garage is in the making. Protecting your automobile. Our vehicles are like family, we name and bathe them, so let’s provide the safest environment for your car to rest all the while protecting it from the outside elements. Organization. Let’s admit that we could use a little help in this department. The designers of Ohio Garage Interiors are masters of the organization; therefore, they have created some of the best garage rack systems in the industry so here’s your chance to let them step in be your garage designers. Increase your home’s value- from nature stone flooring to cabinets, shelving, and racks the possibilities are unlimited to adding value to your home. On the go lifestyles. Most live a non-stop busy life which tends to leave our garage as a dumping ground for the day’s chaos. With cabinets, shelving, and racks this can eliminate the dumping and there will be a place for everything. Expansion of space- The Overhead Garage Rack System allows you to maximize your garage space. Seasonal belongings are troublesome without proper storage space; those with holiday storage boxes and lawn furniture could benefit greatly from this system. Stop Decaying- does your garage interior floor have any signs of any cracked concrete, worn down floors, stains, and more. 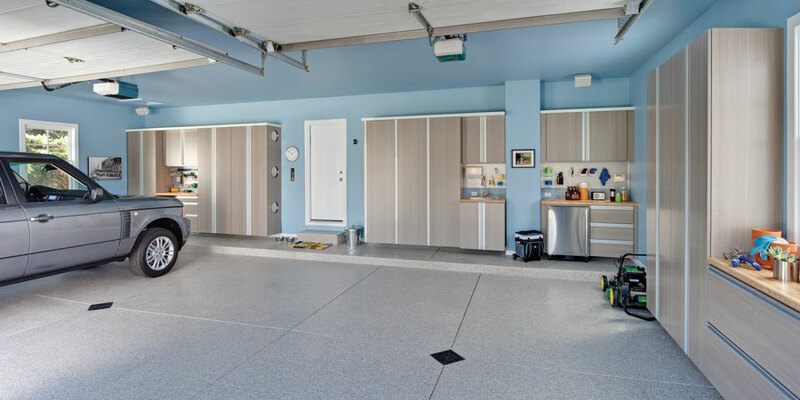 High-traffic spaces demand high-performance coating systems for the ultimate garage flooring, Ohio Garage Interiors excels are garage flooring epoxy coatings. Are you ready to spruce up your garage? Ohio Garage Interiors offers a wide selection of shelving and garage rack options, cabinets or above workbenches, steel tracks, and flooring which can create storage space for items that simply need to stop being an eyesore. The designers of Ohio Garage Interiors are masters of organization and as a locally owned and operated company, Ohio Garage Interiors never use subcontractors. All customers receive service from garage interior remodeling experts and do not employ bait-and-switch pricing strategies. They will always send a professional to your home to provide a quote without cost.